To say that NA had a good first season is a bit of an understatement. 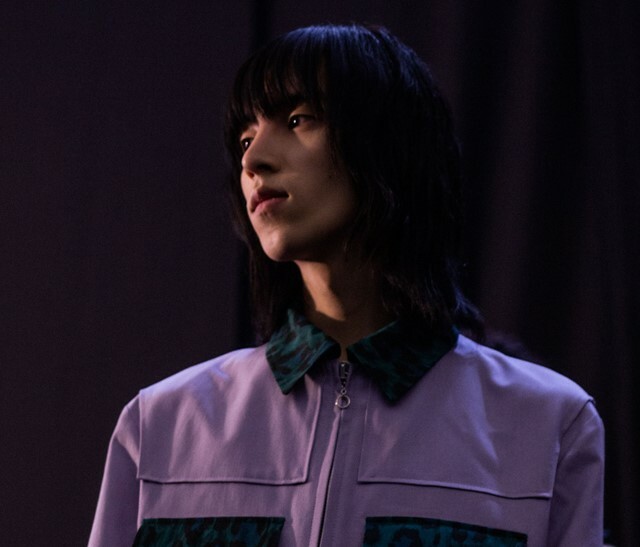 In January, the Korean model wore paint-dashed clothes at Charles Jeffrey, an array of prints at Dries Van Noten and a space-age macintosh at Margiela. He also had his hair smeared with lube at Cottweiler and (on his birthday) was one of the only male models to walk in Clare Waight Keller’s first Givenchy’s haute couture show. Not bad. Aged 25, NA originally hails from Jeju City on Jejudo Island, the capital of South Korea’s Jeju Province. He was scouted – much to his surprise – two years ago while he was out shopping for groceries. It wasn’t long though before he was on the runway, making his catwalk debut at Korean brand Blindness’s AW17 show. Currently completing a master’s degree in fashion, NA’s appeal lies in his unusual features and lithe form but also, according to his agent at Tomorrow Is Another Day, his “nonchalant attitude”. Having just wrapped up Tokyo Fashion Week, NA is now heading back to Europe where he aspires to walk in a women’s show – to encourage young people back home to be confident in how they look and proud of who they are.